Pressure group Tajamuka/Sesijikle says the national dialogue called by President Emmerson Mnangagwa on Tuesday must not be limited to political players but must include every sector in Zimbabwe. "The dialogue must transcend political parties and reflect our society as a whole from business, vendors, diaspora, civil servants, social movements, civil society etc. It must be a dialogue towards full implementation of the new constitution, electoral, media, political and economic reforms and free and fair elections." 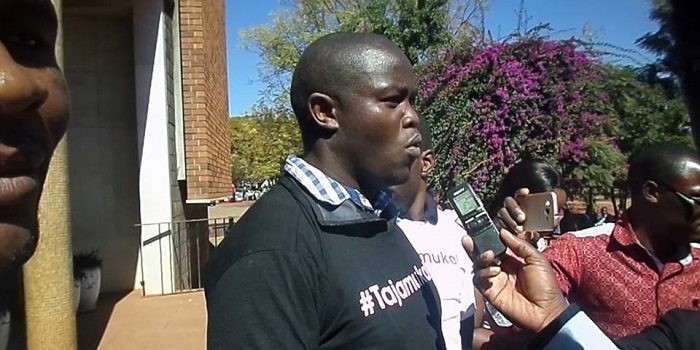 Tajamuka Spokesperson Promise Mkwananzi said on Tuesday. "All this fight was to compel him to call for this critical national process. However, the dialogue cannot just be about the economy as the economic turmoil is only a symptom of the root cause which in our view is contested legitimacy, political crisis and intolerance." Mkwananzi further said before the dialogue commences, Mnangagwa must instruct the security forces to cease the crackdown on civilians and he must release all citizens arrested for politically related crimes. "Mnangagwa must first of all release all political prisoners and stop the military crackdown so as to demonstrate his sincerity and commitment to the process. The dialogue process must be facilitated, supervised and underwritten by SADC and AU and also the principles and terms of reference of the dialogue must be agreed upon by all parties, time framed, bench marked and guaranteed." Mnangagwa o Tuesday called for national dialogue saying political parties must put aside their differences and put Zimbabwe first. "I invite leaders of all political parties as well as religious and civil leaders to set aside our differences and come together. What unites us is stronger than what could ever divide us. Let's begin a national dialogue. Let's put the economy first. Let's put the people first." Mnangagwa said.